First Place Award Winner at The Art of Digital Show! Qing Huang's film The Way is an utterly beautiful 3D computer animation film that utilizes animation software in an unconventional and innovative manner. 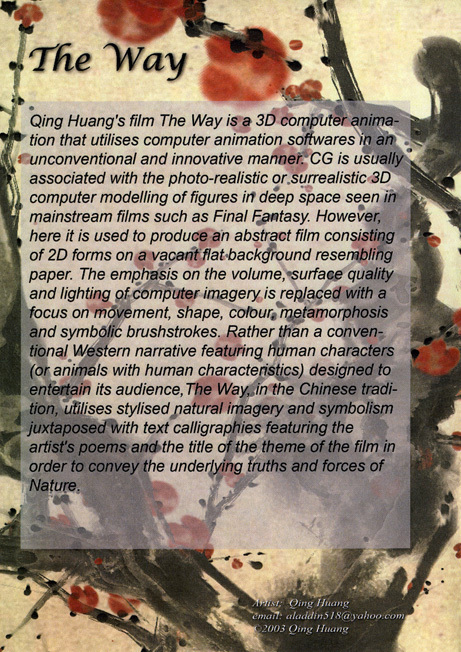 Rather than a conventional Western narrative featuring human characters, or animals with human characteristics, The Way, in Chinese tradition, utilizes stylized natural imagery and symbolism juxtaposed with text calligraphies featuring the artist's poems and the title of the theme of the film in order to convey the underlying truths and forces of Nature. "Qing Huang’s video The Way, is the most beguiling combination of traditional Chinese artistic imagery and cutting edge digital technology. In this masterpiece, music and sound are perfectly employed to compliment the movement and transition of arrestingly beautiful visual images which together in audio-visual harmony reinforce the mood of the piece while advancing the filmic narrative. Huang’s video is an ideal blend of old and new, of abstract and representational, with the creator artfully controlling his technology to achieve the desired result."